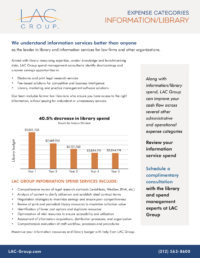 LAC Group spend management experts will analyze your expenditures on and uncover opportunities for savings on business and legal research services, content and data subscriptions, print resources and other expenses. LAC Group manages vendor relationships and their performance against contracts for pricing, service levels (SLAs), key performance indicators (KPIs) and other negotiated terms and conditions. LAC Group evaluates historical pricing and trend data based on best practices and comprehensive benchmarking data across various organizations and industries. We assess how information is acquired, processed, organized and delivered by evaluating workflow, processes and procedures. This analysis will enable you to align your information center with strategic business goals and ensure that user information needs and requests are met. LAC Group advises on resource consolidation, service-bundling, and other options to maximize budgets. Examining new and established research and information services, user preferences, pricing updates, service levels and considerations, we will match the best offerings to meet your information needs while improving your bottom line. Check out our case study for a look at the evolution of the information and research subscription service industry, from LexisNexis and Westlaw to numerous niche vendors and new offerings.